PES 360 x 360 Jumbo hoop has a name change. It is now named Jumbo Frame 14" x 14". When selecting the Jumbo Frame 14" x 14" you will see the maximum design size of 350mm x 350mm appear in the bottom right corner of the Hoops dialog box. To see the name in the list, click the "Reset Factory Hoops" button after the update has been installed. Improved splitting of the Jumbo Frame 14" x 14" file for the BNT10 embroidery machine. Now saves in file's original colors. A .TXT file is automatically created when splitting a Jumbo Frame 14" x 14" design for the BNT10 machine. The .TXT file will show the color sequence for both sections of the split file. You can now uninstall SizeWorks from the Start/All Programs menu. Better integration with CustomWorks II for Vista 64 and Windows 7 64 users. Improved icon viewing with BNT10/Enterprise embroidery machine. When SizeWorks Stand Alone and HoopWorks Stand Alone are installed on same computer, SizeWorks will auto-split a 360 x 360mm Jumbo Hoop design when saved from SizeWorks Stand Alone. A check box has been added to the Preferences in Studio III for the auto-splitting in SizeWorks. Compatible with Studio III 3.10 update and later. Note: Studio Plus users will need to upgrade to Studio III version 3.10 to have the ability to use 360 x 360 Jumbo hoop features. Can now write file for the Jumbo Frame (see #1). The file will be written as a single file for the BNT10 Enterprise machine. 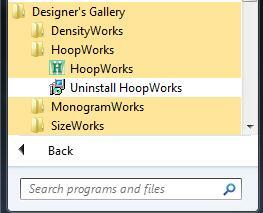 HoopWorks is now stand alone or can dock to Studio III, Studio + or CustomWorks programs. It can also be used in combination with MasterWorks II when creating designs for the Jumbo Frame and saved as a pes9 file. Note: Please download the corresponding SizeWorks and Studio III updates. These additional updates will allow you to easily size designs for the 360 x 360 hoop in SizeWorks and view the 360 x 360 split files in Studio III.CustomWorks II update for the 360 x 360mm Jumbo hoop will be coming soon. Hoop-It-All Super Giant L, 300x300, 300x400, 300x500 hoops.